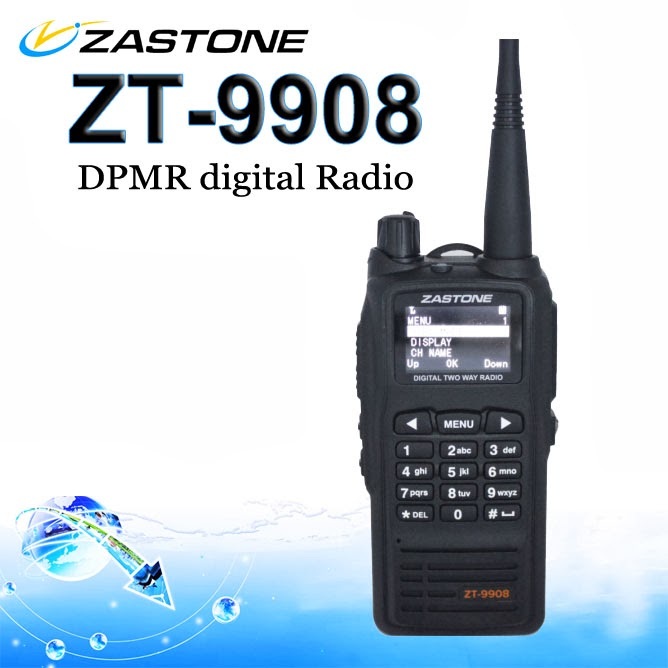 Nate found another digital radio... the Zastone ZT-9908. You can get one for $97 at Amazon or $103 on eBay. "Zastone (a company known to release clones of the UV-5R, and more recently a clone of the BJ-9000) have updated their website recently." So many standards to choose from. All we need is more than one manufacturer to support one. Until then, it's good ol' analog for me, it just works. Well I got mine today. I was told its best to put a password in these digital radios. I programmed a 4 digit code in this zt-9908 and it made its own 6 digit code. Now I cant get pass the password screen when I turn it on. Did you test with kirisun devices? are they compatible? I found out there is a password issue with these radios. When putting in a password use 6 digits or you may get locked out. Resolution to lockout that you wont find in the manual is a reset. To reset hold the 1 key down then turn radio on. I'm new to this type of radio but so far im not pleased with the analog reception. It should be compatible with the kirisun since I believe it has 3 codecs to choose from. I'm sure all these over seas radios talk to each other. All functions can not be programmed via software. To test digital I'll be buying a Kirisun or a MYT DP-208 soon. As far as size goes, if you have a baofeng with standard battery and one with extended battery. This radio is in the middle as far as height. It's just a little bit thicker. Feels really good in the hand. Perfect size. I love the electro screen. Tired of that baofeng 3 color crap and toy flashlight. This radio looks nice and looks professional. I hope someone makes a yahoo group on this radio. Another good test for all these digital radios is to find out if a reset will fix a stunned or killed radio. By the way. Those guys selling this radio on ebay for 103 bucks are great. They are fast promt and polite and always will assist in any problem with anything they sell. (hence the password issue) It's a lil bit more than amazon but the help I received was well worth it. They broke their necks to get that password issue resolved for me. It usesw the same programming cable, mics etc. as the baofengs and kenwoods. So if you already have a baofeng cable your good to go. I just ordered ZT-9908 today so I can play around with them and understand how they work. I was reading Kenwood has come on board with DPMR. Is the zt9908 compatible with other dpmr "officials" devices such as icom idas? Do you prefer this radio or the Kirisun? Anyone any experience on using these with digital amateur repeaters ? And are they compatible to talk with the Motorola digital radios ? I cant make it scan. my baofeng I just push "*" and it scans all the channels. I tried the scan on here and as soon as I let go of the button it stops wont continously scan. any help let me know. Its about time zastone released a help file for the programing software which is very vague to say the least, I have V1.54 and V2.0 and neither come with help files? anybody found a google group or yahoo group about these radios as I realy like mine but just like my little recent rs-309d its being wasted just on analog FM. The zastone has 3 vocoders to choose from and will even make the little Recent come to life with a screen notification that a call is being received with the correct sender radio ID but no audio is passed and messages are garbled chinese symbols and boxes? The RS-309D uses the strange IHELP version 540.1.1 from the PLA University of Science and Technology vocoder and nothing else even makes it light up so the Zastone has been the nearest yet. I noticed on youtube that they are compatible with the retevis and tyt dpmr radios, I do hope somebody works these radios out fingers crossed.